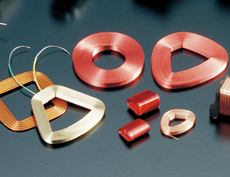 High Precision Coils – Shibata Co., Ltd.
We can provide various kinds of coils for trial and mass productions. Shibata Co., Ltd. selects the most suitable wire from its large range of magnet wires, and utilizes its winding technology and plastic molding know-how that it has accumulated over many year in order to produce high performance coil products that meet the needs of the customer. Ribbon Coil Compared with a round wire coil, it has a better lamination factor with flat surfaces. Thin coil with ends at the winding start and end points.